On the first day of the week, Mary of Magdala came to the tomb early in the morning…and saw the stone removed from the tomb. So she ran and went to Simon Peter and to the other disciple whom Jesus loved…. So Peter and the other disciple went out and came to the tomb…. 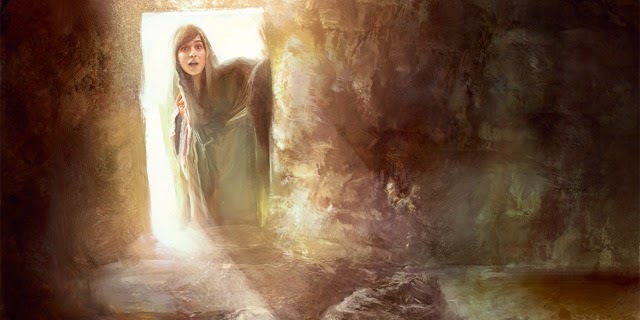 When Simon Peter...arrived he went into the tomb and saw the burial cloths there, and the cloth that had covered his head, not with the burial cloths but rolled up in a separate place. > Most people love a story with a good ending – a story where the good guys win and the bad guys lose. In real life, even when things look bleak we still hope against hope that things will turn out well, even when it seems almost impossible. > The story of Easter is the ultimate good-ending story. The disciples discover the empty tomb, and then realize what has happened: the Lord has been raised from the dead – an impossible ending if there ever was one! This is the good-ending story that makes all other good-ending stories possible. > Whatever the first disciples experienced, it was something that no one had ever experienced before, and it convinced them that the Lord was alive. Our faith -- and our lives -- are rooted in their conviction – God has conquered evil, sin and death once and for all. Although we do not fully enjoy the consequences of this fact yet, there’s no question about how this story turns out. > Every Eucharist is both the expression and the experience of the Easter miracle – Christ alive and living among us; let our lives reflect that fact. > Question for Children: Can you think of something good that has happened which you thought would never happen? > Question for Youth: There is a lot of trial-and-error in growing up, and things don’t always turn out the way we hoped they would. Does your faith help you hope that they eventually will? > Question for Adults, Families and Faith Communities: Do we live our lives in ways that give other people hope, even when it seems almost impossible to go on hoping?